ASPE Onlus – “Association for the Development and Promotion of the Peoples of Eritrea and Ethiopia” – is a non-governmental organization devoted to human development and social promotion projects in Ethiopia and Eritrea. Side by side with the above, in the city and province of Milan, it offers legal, social and humanitarian assistance to the members of the Ethiopian and Eritrean community of immigrants, in such areas as the search of employment and accommodation, as well as the distribution of food and clothing. ASPE Onlus was established in Milan on April 29, 2003 with the late Abba Habtemariam Ghebreab – a Capuchin friar of the Province of Eritrea – as the president, and with the support of other Eritrean Capuchin friars. Along with them, the founding members and the board of directors consist of a group of lay supporters and volunteers scattered across Italy. Till the day of his sudden and untimely death, Fr. Marino coordinated and directed the main activities of the Association. Thanks to his tireless dedication and extraordinary organizational skills, ASPE has become active not only locally, but also at the national level. As a recognition of his achievements, Fr. Marino was awarded a Certificate of Civic Merit by Milan’s Municipality in 1987. In 2009 he also received the Peace Prize from the Lombardy region. A Golden Medal of Civic Merit was again granted to him in 2012 by the Milan Municipality for his distinct contribution to the welfare and wellbeing of the poor and the refugees. For many years the registered office of ASPE Onlus was located in Via Castelmorrone, 6, Milan. 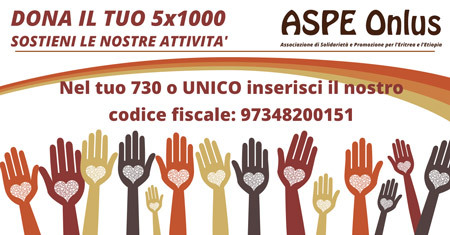 Since 2005, the Association has a new registered office in Via Cislaghi, 5, Precotto (Milan), a donation from the Capuchin Province of Eritrea.